The road-head for this region is Govind Ghat. Having reached here by road, it is time to have a drink at the local Chai-Puri-Wallah and forget that wheels exist. Forward of this point, mobility is provided by mule-power, if you cannot handle the walking. Getting here just around mid-morning is ideal. The heat can be unbearable in July and August. The humidity is a major factor too and with ten Kilometers ahead of you through some rough terrain, you better have lace up your boots. The trail to Ghangria - the overnight stop, is at least steep! A lemon and some salt helps tired muscles revive, as experienced by the writer on the recommendation of a local from the region. It works! Ghangria serves as a night halt for anyone interested in getting to Hem Kund- a holy Sikh shrine (where Guru Govind Singh is said to have meditated) or to the Valley of Flowers. Since overnight camping is not allowed at both places, Ghangria is crowded and overflowing with people. The food at the restaurants is good however and the people are very friendly. GMVN provides a comfortable lodge and a tent facility which is clean and tidy. Hot water is provided in buckets. There are several other places that offer overnight accommodation. It rains a lot in this part of the mountains, especially during the night which leaves everything damp. The walk up from Govind Ghat is painful, for even the most seasoned trekker- some of course, refuse to admit it! Food at the local restaurant in any form feels divine going down. The synchronized singing of the spectacular array of birds (which include the colorful Golden Oriole, and the Himalayan Green Pigeon) is a treat to the ears at dawn. 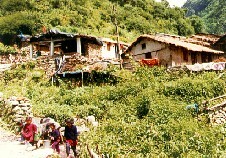 The cobble-stoned path out of Ghangria splits about four hundred meters from the village. 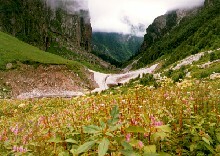 The right fork takes you to Hemkund and the left to the Valley of Flowers. A little further up is the toll-gate where you pay to enter the valley. A separate charge is levied for Indian citizens and foreign Nationals, the former paying a lot less. The main floral portion of the valley is about five Kilometers from the toll-gate. Mules are not allowed to enter the valley and you have to walk to get there. However, this hike is not very strenuous, yet it is wise to be prepared for the heat and humidity. The fog rolls in during the afternoon, so it is advisable to set off as early as you can. The valley itself is at least a couple of Kilometers wide and ten kiloeters long . It is impossible to do it all in a day, yet one can get a fair idea of the flora in this region. The flowers in the valley are amazing. Of course, you cannot see all the four hundred odd varieties that are said to grow here, as different varieties are spaced out between the growing season. Early August is best as there is a riot of color on the valley floor as you can see in the picture to the left. The famous resident of the Valley of Flowers is undoubtedly the Cobra Lily. Seen here in the two varieties, in the pictures on the left and right. Named for obvious reasons, the lily is quite common throughout the valley, yet a good specimen is difficult to find. The conditions in the valley where rain is an everyday occurrence and the fog brings even more moisture, makes for ideal growing conditions for the Cobra Lily and other vegetation in the region. Thanks to the preservation efforts of the government and its efforts in preserving the flora of this region, specimens such as those seen here might just be able to thrive, so that future generations may enjoy them. The Himalayan Blue Poppy is unique to this region. It is beautiful to look at and against the back drop of rocks it stands out. It also has a bad habit of growing in places difficult to get at and makes it a challenge to photograph . Some folk have been lucky to find a specimen within easy reach. Most of the time however, you have to risk life or limb to get a specimen in good view. This valley is an enchanting place and many folk venture to come and look at its splendour. Over the years the paths have been damaged due to erosion and even though the Government has taken the necessary steps to quell the decay , things are not as good as they could be. 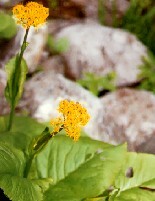 Visitors often pluck flowers and make their mark by leaving behind garbage that will never leave the valley. Soft drink cans, candy wrappers and carrier bags are only a few of the things left behind, not to mention cigarette butts. Sustained damage to this sensitive eco-system will almost certainly leave the valley ruined for future generations. One easy way out for the Government would be to bar entry to the valley! This would of course mean, draining the lake for a couple of dragon flies. However, if everyone visiting this tranquil valley, brought back what they took with them, then the drastic measures taken in the past would be unnecessary!